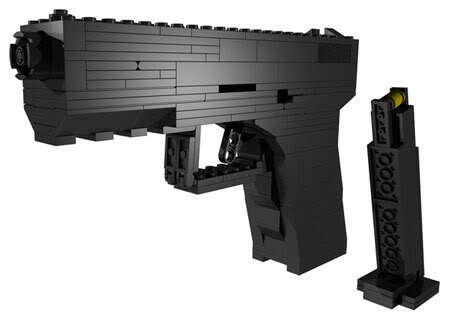 Jeremy Bell was fixing up his Lego looking gun from online in his office and shortly the SWAT team visited his office. Apparently the neighbour from the opposite window saw the gun and infrom to the local police. You may read more of Jeremy's account at his blog. Here's a new video about the incident. So what's that brick gun about? Jeremy bought this Semi-auto lego gun that come magazine slot at brickgun.com. It's wonderful how basic building bloc can create. They have for gundam and zaku too. You mean Lego or brickgun have gundam or zaku? Thanks for the good laugh when I saw this at school today. Funny thing is he's not far from my school too! haha! Fire projectiles can be dangerous. Lego brick quite hard. Really? Near your school? So you getting one? would be super bad luck abiut getting the swat round. Seen lots of amazing lego contructions on flicker. I wont called it a bad luck. It's an harmless experience.